Recently, we have heard about the Iocean, the Chinese company, entering the Indian market with the announcement of launching 5.3 AND 5.7 INCH Smartphone with Dual Core and Quad Core Processor in India. But before the Iocean launching its product, the another Chinese handset maker, UMI has entered the Indian market with this 4.5 inch HD display totting phone which is priced attractively at Rs 9,999 and comes with attractive features. This Smartphone got the dimension of 129 x 68 x 8.5mm which will be weighting around 160gms and with this thickness (8.5mm) and weight (160gms) it can be categorized as both slim and lightweight smartphone. It i featured with 4.5 inches HD multi-touch and AGC Tempered glass screen with the resolution of 1280×720, supporting 1600k colors. The pixel density is 326 PPI and could support multi-touch upto 5 point touch. Like most of the other Chinese phone this smartphone will also support Dual Sim functionality. The phone operates on Android 4.0 OS and is powered by 1.0 GHz MTK6577 Cortex A9 dual core processor with IMG SGX531 ultra GPU. It is provided with 1GB RAM and 4GB of Internal Memory. The Smartphone is also featured with Back camera upto 8.0 Megapixels with CMOS flashlight and Front camera upto 2.0 Megapixels and can also support connectivity like WiFi with standard IEEE 802-11b/g for data transferring, Bluetooth 4.0, GSM 850/900/1800/1900MHZ, WCDMA 900/1900/2100Mhz. The battery for it looks bit weak with 1750mAh rechargeable lithium battery. RAM and ROM: 1GB RAM and 4GB of Internal Memory. Connectivity: WiFi with standard IEEE 802-11b/g , Bluetooth 4.0, GSM , WCDMA 900/1900/2100Mhz. Battery: 1750mAh rechargeable lithium battery. It will a good competition to watch between this chinese company challenging the Indian market. The Micromax Bolt A35 and Huawei Ascend Y210D will get a good competition with the launch of UMI X1. 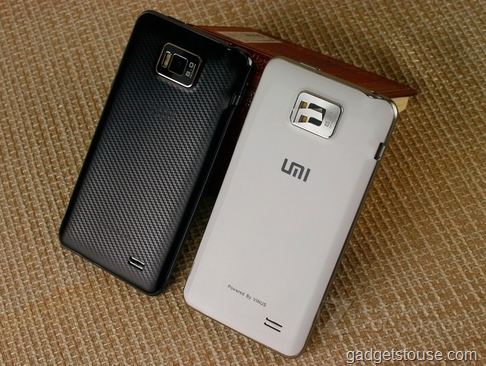 Also the latest launch of Hauwai: the Huawai Ascend G600 could have a threat from UMI launch. The phone is now available in Black and white color with the price tag of Rs.9,999. UMI X1 comes with the best display in its category but we don’t see the phone offer anything extra on what is already available. With not much awareness about brand and low battery power the phone could find difficult to survive in the Indian market.